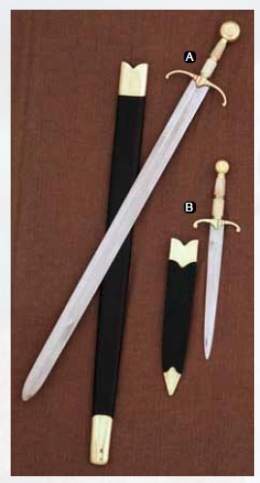 A: SWORD came to be known as the Guingate. The blade is hand-forged of EN45 high-carbon steel. Pommel and guard are brass, gorgeously setting off the bone grip. Includes scabbard. Blade Length: 28.8" Blade Width. (Widest): 1.9" Overall Length : 36", single tang, leather covered scabbard. This page was last modified on 7 June 2014, at 18:56.